Build A Trail. Win A Bike! 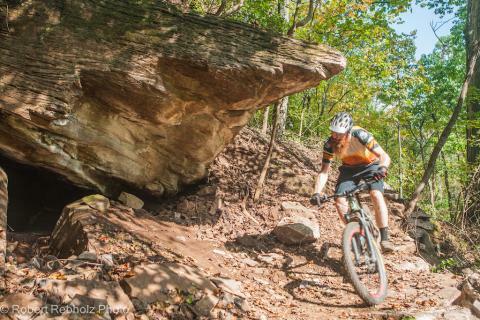 From the people who brought you #DowntownDownhill, Tuesday night rides and multi-use trails throughout Knoxville’s Urban Wilderness… comes a new improvement project for us ALL! Not only will Marie Myers Park be a #yearroundgetdown, but you could be shredding it on a brand spanking new bike from AMBC, Transition, and Tennessee Valley Bicycles! ENTER NOW! Published on October 02, 2018 by ambcknox. In which our pal Shaggy leads his host around Knoxville and some of our neighboring trail systems. Published on September 21, 2018 by ambcknox. Fall 2017 – Spring 2018 Work Party Schedule! 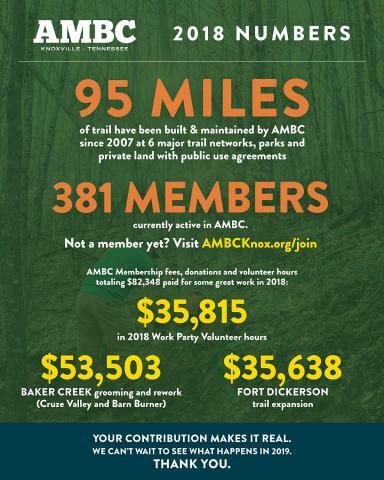 AMBC Work Party dates are posted thru Spring 2018. Mark your calendars and follow us on Facebook or Twitter for updates and more information! Published on October 06, 2017 by ambcknox. AMBC’s work day on April 30th will be very different from our typical work party. We have partnered with Comcast and Legacy Parks Foundation to put some of the finishing touches on the first phase of work at Baker Creek. For each volunteer at the work party Comcast is going to donate to Baker Creek Preserve, so be sure to come out and bring friends and family! We’ll be working from 8am – 2pm. Participants need to bring the standard work day items – gloves, sturdy shoes, and water. We’ll take care of the rest. Lunch will be provided by AMBC and Legacy Parks Foundation. Day-of registration begins at 7:30am at the AMBC tent, but preregistration is highly recommended — Register online here. Published on April 13, 2016 by ambcknox.